A Good Year at e.l.f. They bill themselves as one of the fastest growing cosmetics companies in the U.S. and with the kind of year e.l.f. has had in 2016, who’s going to argue? Chain Store Guide isn’t, and we think that they’re one to watch in the health-and-beauty space. Results will be official in February with the release of its Q4 earnings statements, and the results are projected to include sales growth north of 18% for the year, a year which has included a successful initial public offering in September, significant bricks-and-mortar expansion and growth in top-of-the-line partnerships. The manufacturer and retailer of “prestige-inspired” (their words) cosmetics posted a 2016 third quarter that grew by 11% when compared to the third quarter of 2015. That Q3 2015 included the company’s launch of its product line into 6,900 CVS stores, making the latest results that much more impressive. Source: Chain Store Guide’s Database of Drug Store & HBC Chains. e.l.f. followed up its partnership with CVS in 2015 by adding distribution with Ulta.com and placement on all Walmart Canada store shelves in 2016 to go along with existing US partnerships with Walmart, Target, Old Navy and Amazon among others. Agnostic as to where consumers purchase its products, we can expect e.l.f to provide insight into new retailers joining the mix when the company announces full-year results in early 2017. Turning back to 2016, though, the company solidified another facet of its multi-channel strategy by adding to its own portfolio of retail stores, more than doubling store count to 17 (e.l.f. opened seven stores in Q3 alone) and establishing a West Coast presence with its first three LA stores. More important than the revenue that all of these new stores bring are the expanded opportunities they present for face-to-face consumer engagement and brand building, two strengths of the company in the digital space. • Another affordable brand with an increased retail presence and growing multi-channel aspirations that we’re keeping an eye on is NYX, part of the L’Oréal portfolio since 2014. 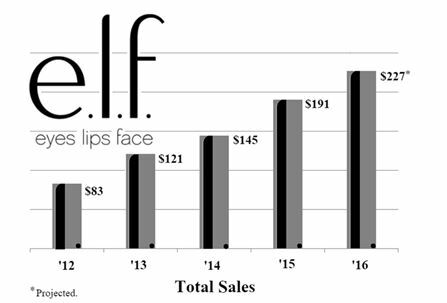 Moving in the opposite direction geographically as e.l.f., NYX expanded to the East Coast in 2016 and closed the year with 23 locations.